THE FULLY REDESIGNED 2019 SUZUKI KINGQUAD. 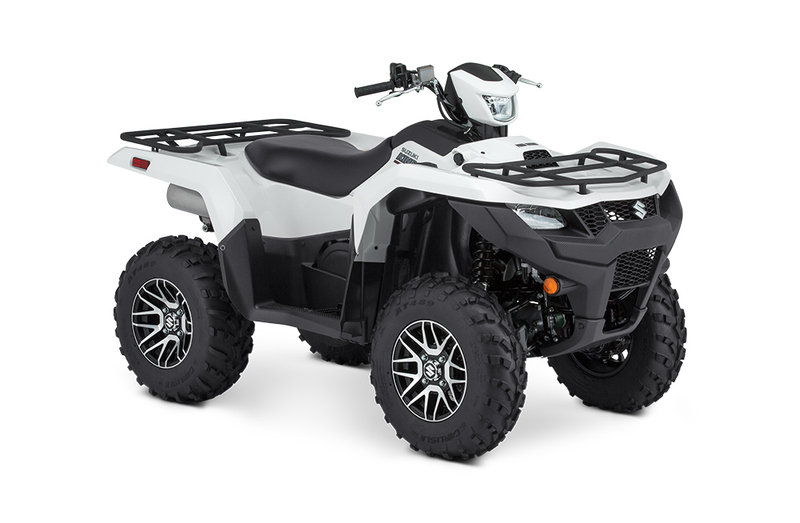 From the company that invented the four-wheel ATV comes the NEW KingQuad. Legendary performance and reliability engineered to do even more. TAKE CONTROL OF YOUR STYLE WITH MANY OPTIONS. Fully independent suspension with new gas-charged front and rear shocks contribute to precise handling on any terrain. Towing capacity increased to 1322 lbs. with new, receiver-type trailer hitch mount. Frame rigidity increased and rear suspension and final drive case brackets are reinforced for added strength. A new handlebar-mounted headlight is added, which illuminates the trail where the steering is pointed. A low-draw LED taillight has been added for better visibility. New multi-function LCD instrument panel with service reminder. Three storage compartments for optimum convenience. AT YOUR LOCAL SUZUKI DEALER TODAY! Suzuki Motor of America, Inc. (Suzuki) is committed to improving the accessibility of this website to individuals with disabilities in an effort to make this website accessible to as many users as possible, regardless of the challenges they may face. As part of our commitment to continual improvement, Suzuki is implementing applicable elements of the World Wide Web Consortium’s – Web Content Accessibility Guidelines 2.0 Level AA (WCAG 2.0 AA). If you require assistance or wish to report an issue related to the accessibility of any content on this website, please email WebAccessibility@suz.com. If applicable, please include the web address or URL and the specific problems you have encountered. *Only available on select KingQuad 750AXi models, or Power Steering models. 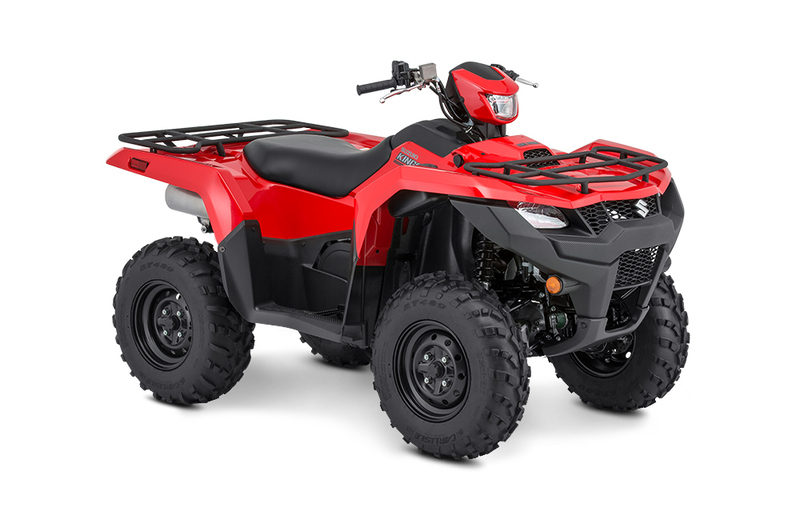 The Suzuki KingQuad ATV may be used only by those aged 16 and older. Suzuki highly recommends that all ATV riders take a training course. We’ll even pay for it. For safety and training course information, see your dealer or call the SVIA at 1-800-852-5344. ATVs can be hazardous to operate. For your safety: always wear a helmet, eye protection and protective clothing. Always avoid paved surfaces. Never ride on public roads. Never carry passengers or engage in stunt riding. Avoid excessive speeds. Never ride under the influence of alcohol or other drugs. Be extra careful on difficult terrain. Along with concerned conservationists everywhere, Suzuki urges you to Tread Lightly!® on public and private land. Professional riders with advanced skills shown in some photos. Suzuki Motor of America, Inc. makes every effort to present the most current specifications and product features at the time of publication. Because of our policy of continual improvement, changes may be made in equipment, availability and specifications without notice or obligation. Suzuki, the “S” logo, and Suzuki model names are Suzuki trademarks or ®. © 2018 Suzuki Motor of America, Inc.